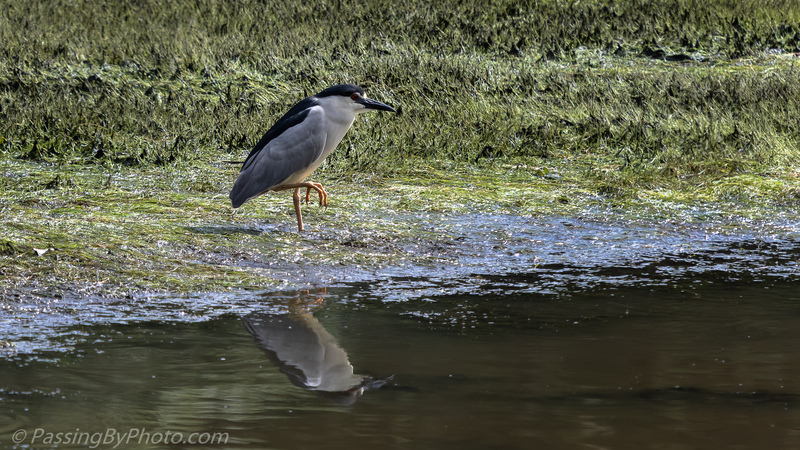 A Black-crowned Night-Heron struck a classic pose and held it for a very long time. 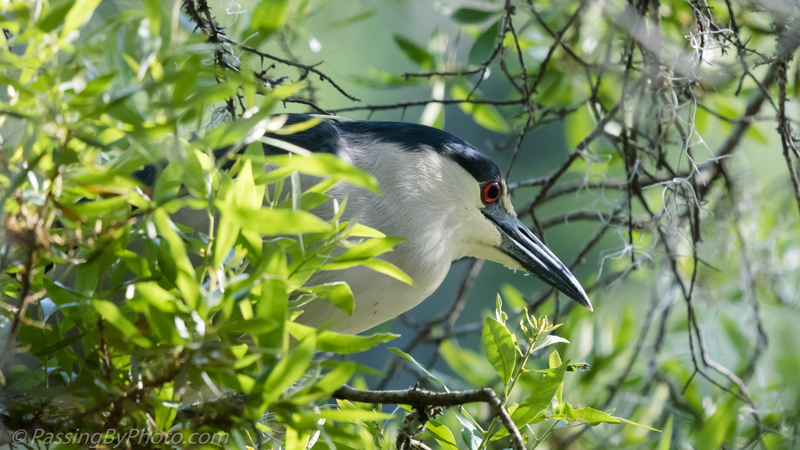 This tree fell into the pond giving him a great undercover spot to watch the water. 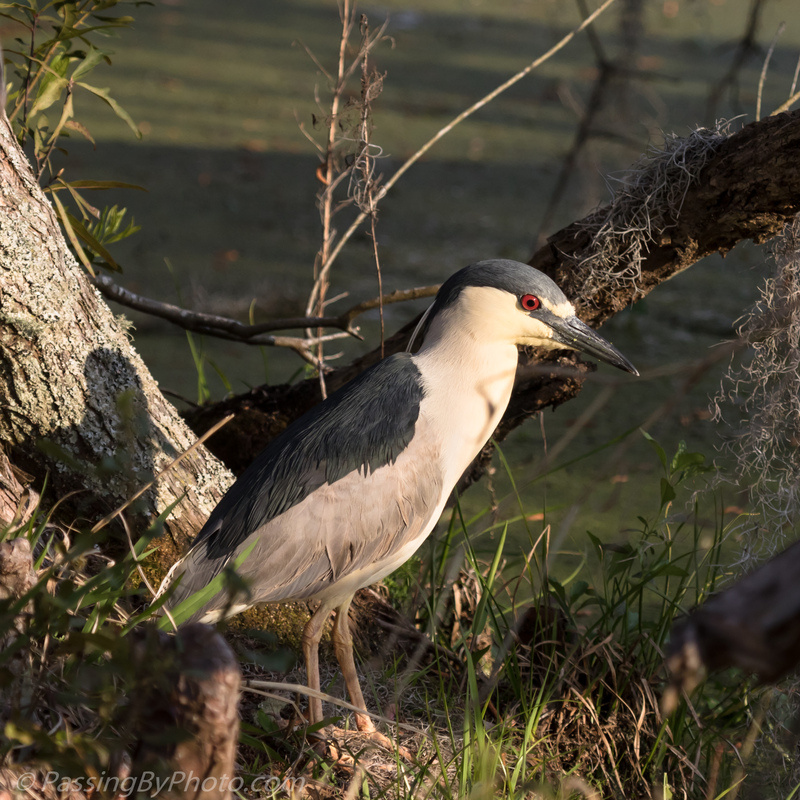 This tree sits on the edge of the dike where I’ve recently been watching the White Pelicans, Wood Storks, and Eagles in the rice field pond. 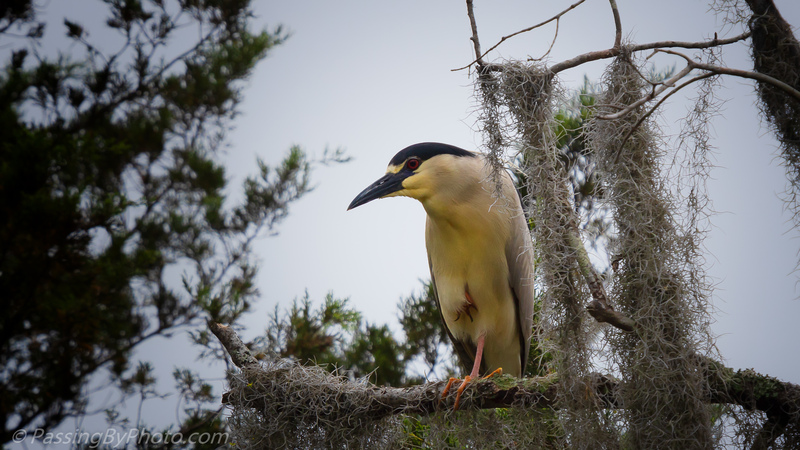 The Black-crowned Night-Heron sat there quite awhile watching too, giving me an excellent view of his red eye. Then he stuck his tongue out! Sometimes you are in just the right spot. 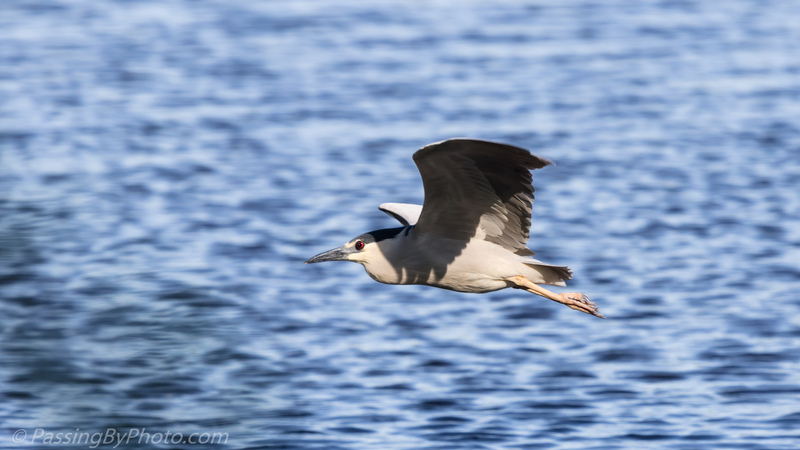 This Black-crowned Night Heron flew over the marsh and then right in front of where Ted and I were standing. 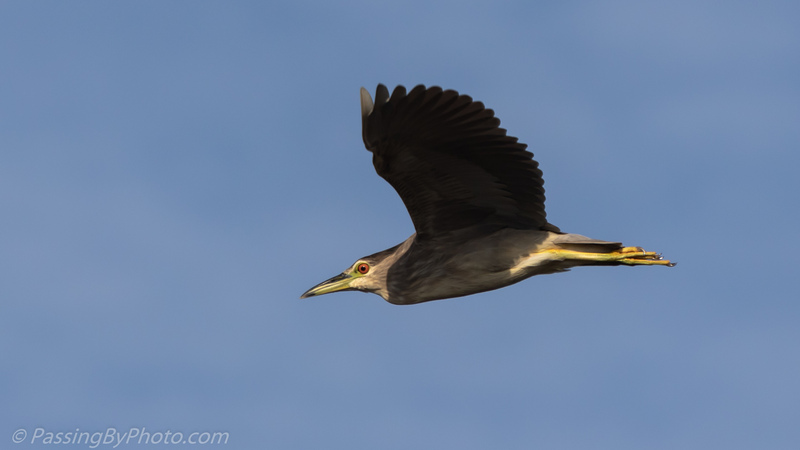 I was expecting him to veer off as he got closer as we were right out in the open, but he obliged us with a slow, steady flight. 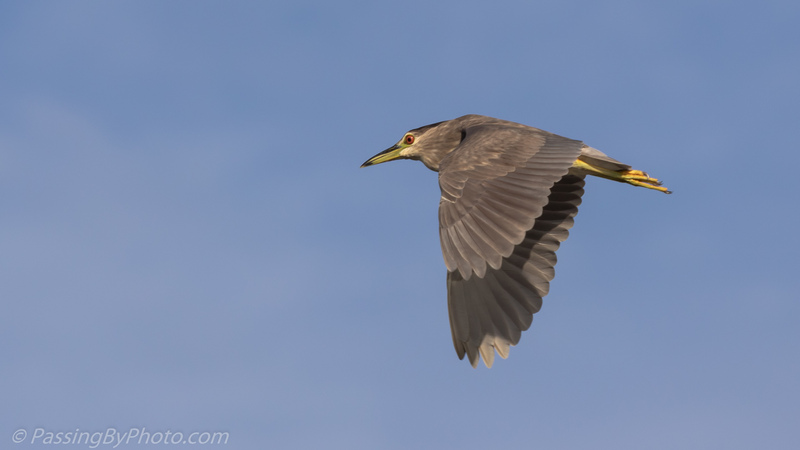 Disrupted from his hunting spot this Black-crowned Night-heron took a flight out over the pond. 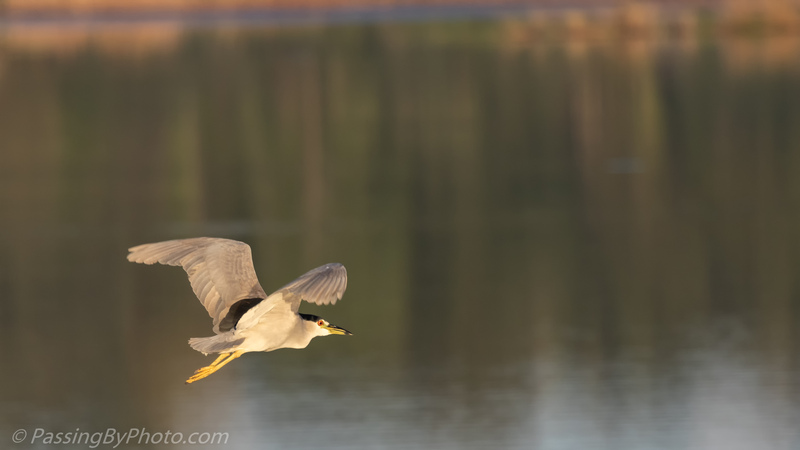 This was about a half hour after sunrise, with a golden glow on the heron and the pond. 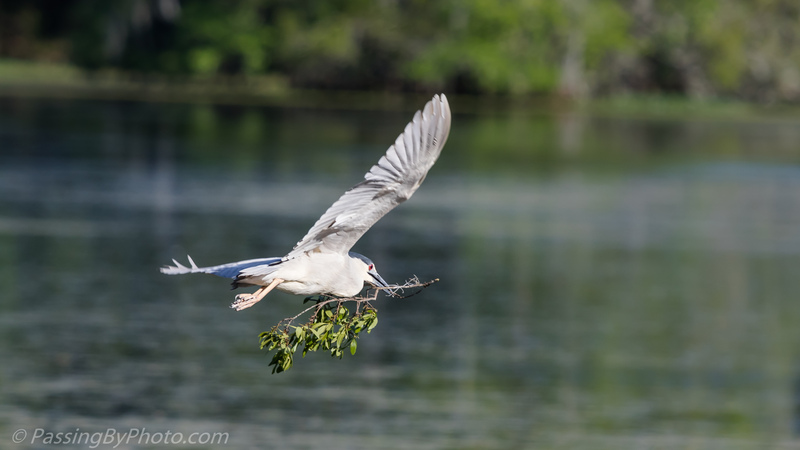 He opted to land in the “spoonie” tree, so named by photographers because the Roseate Spoonbills like to congregate there. 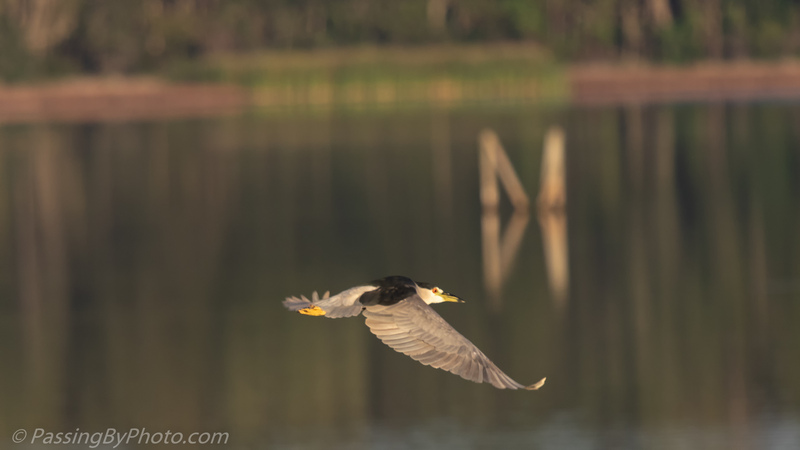 On this morning a single Anhinga was defending his spot. 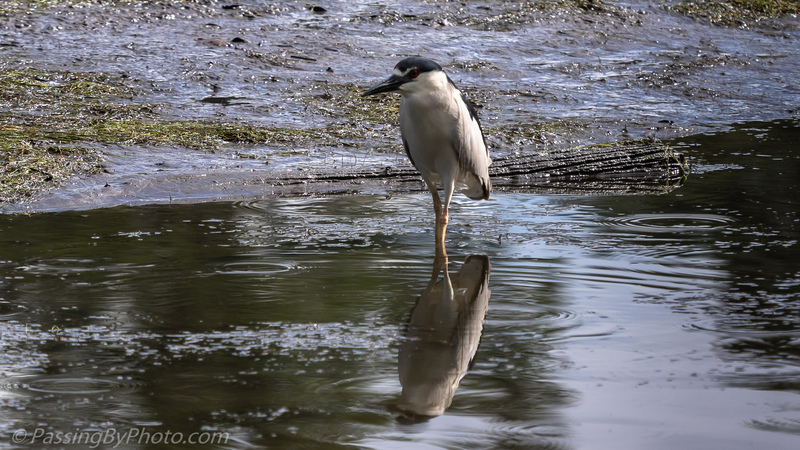 It was unusual to see a Black-crowned Night-heron out in the open like this. 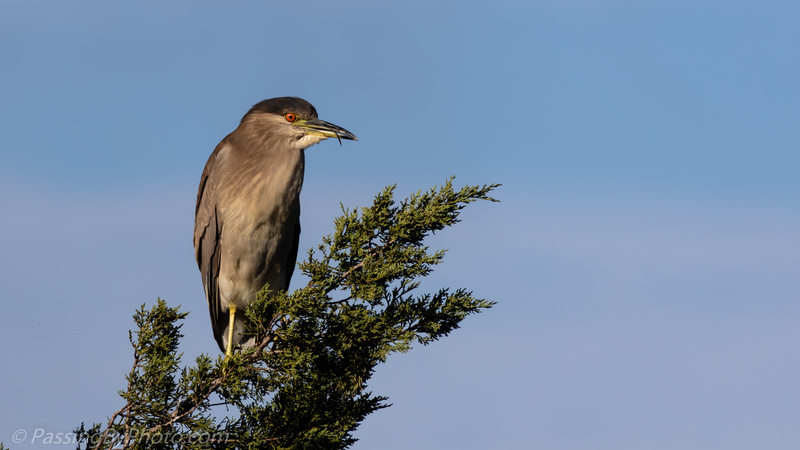 They usually are in a tree or hidden by undergrowth, especially if they aren’t actively feeding. He’s standing on the interior of a pond that just two days before was under water on a high point that made an island. The pond is being drained, likely to control the growth of this grass would eventually choke the pond. When I passed by a second time it had started to sprinkle. 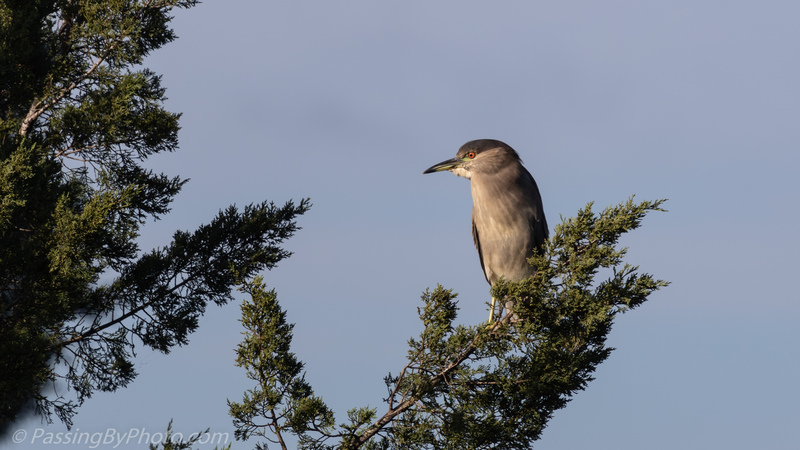 Surveying his realm, this single Black-crowned Night-Heron was on a small island in what was an active Little Blue Heron rookery last year. 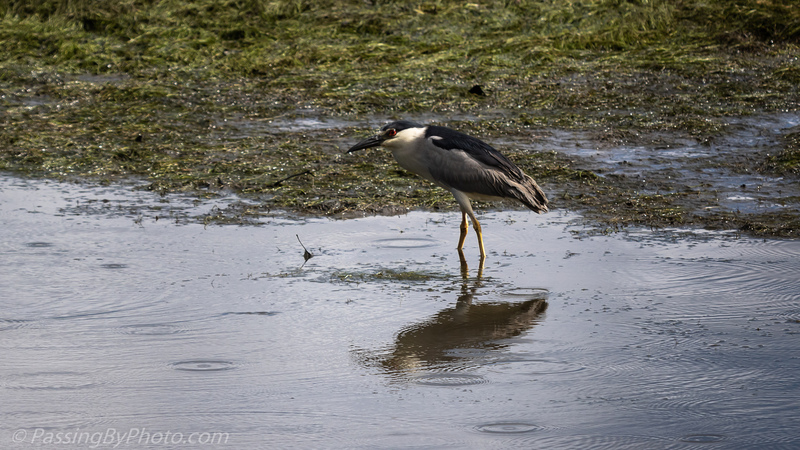 This year he seems to be the only wading bird using it. 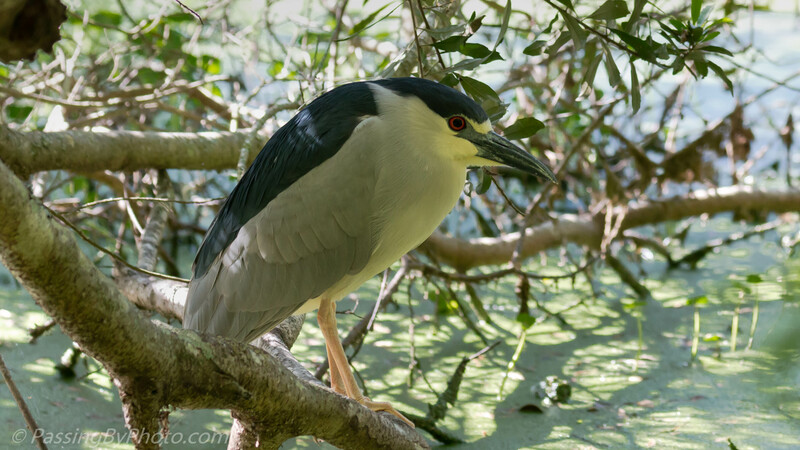 Shortly after I took this picture he dropped down into the center of the island out of sight, presumably to a nest. 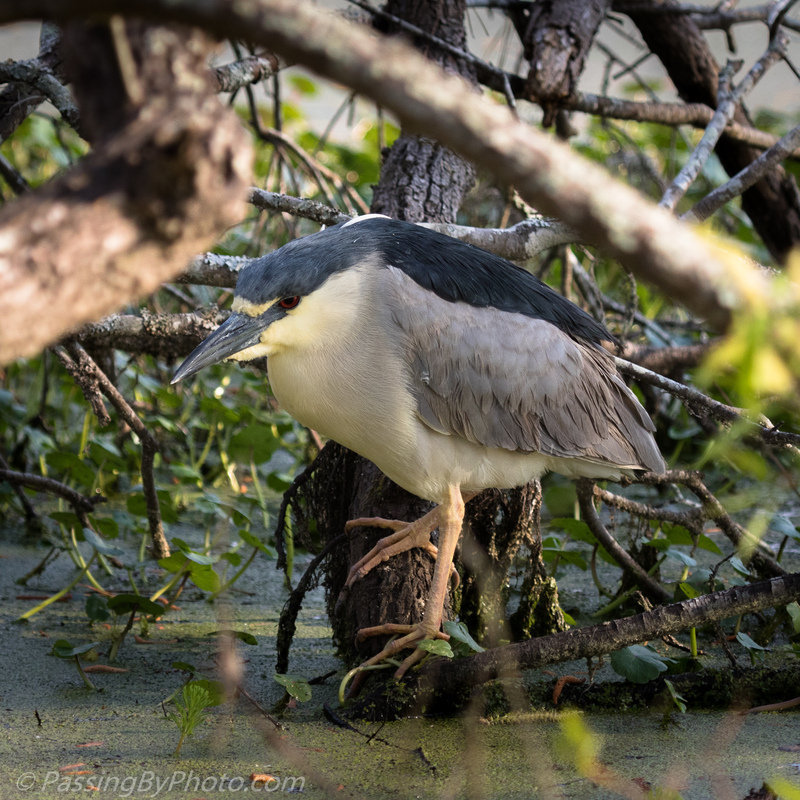 Back and forth from the rookery island to the shore of the pond this Black-crowned Night-Heron diligently brought sticks for his nest. Once in the shrubs he took his time, with a lot of inspecting going on before the actual stick selection. 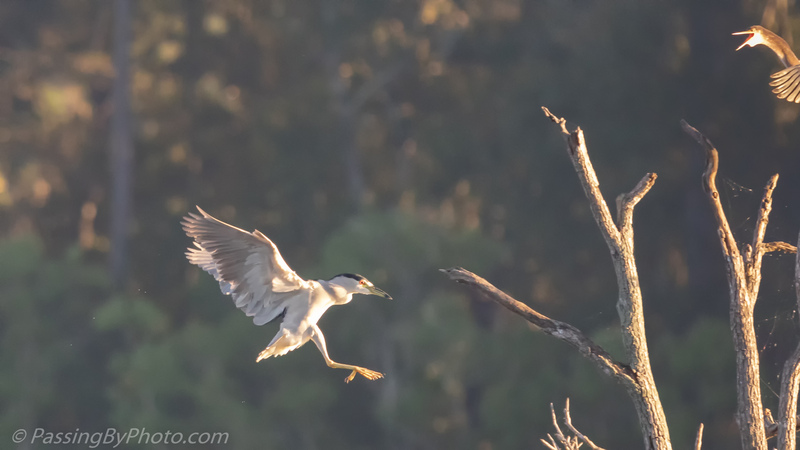 Sometimes the selection was a live branch, snapped off with that powerful beak. This one was substantially sized, complete with green leaves for padding. 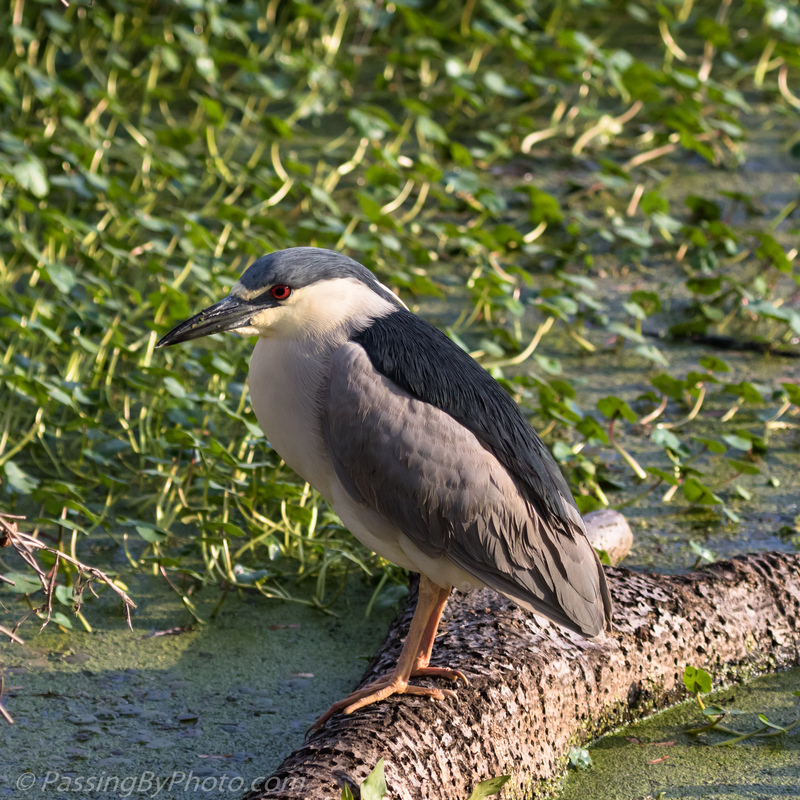 I’ve seen a Black-crowned Night-Heron on this stretch of bank where some trees have fallen into the pond the past few times I’ve been there. It may be the cover of the limbs that attracts them, although they are exposed to the walking path on the inside. I was hoping he would do some fishing, but he just looked around. I did get a full side view that shows off his beautiful color scheme, and that red eye! 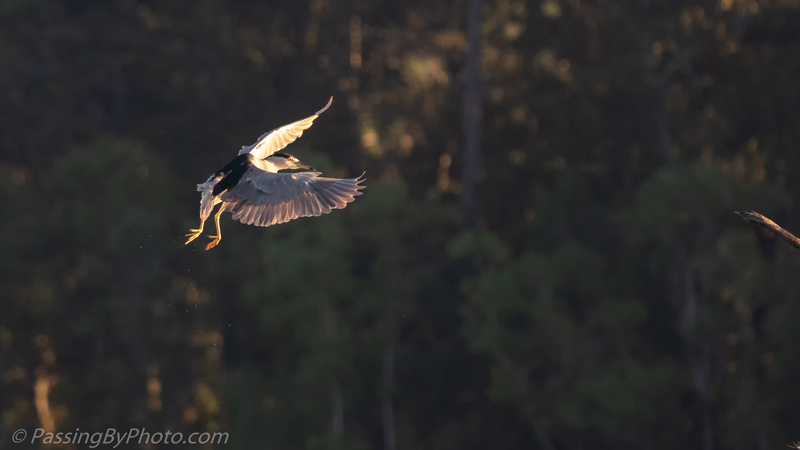 He eventually flew off but either he or another one returned less then ten minutes later, this time taking a position in the late afternoon sun.